Example of Drip System and Related Components – Courtesy Wiki Commons and Jain Irrigation Note: the design of the grids at the Garland Community Garden will be different and we won’t have all these components as we are not drawing our water from a well. However this illustration does include all the parts we will be using: Main line, sub-main line, flush valve, emitter lines that will deliver the water, end stops etc. Our hose bib (faucet) will be connected with a battery-operated timer, backflow, y-filter reducer and a ½ inch adapter to one of the faucets. You are invited to assist in building a Hose Bib (faucet) Drip Irrigation System at the Garland Community Garden. You can use the knowledge gained in this experience to install a drip irrigation system for your own garden and you can have some fun working with members of Loving Garland Green. Check out our new Little Free Library while you are there and have some coffee and donuts with us. We look forward to meeting other interested urban gardeners and water conservationists. Back in the spring our Dallas County Extension Agent, Stephen Hudkins, along with Jeff Raska, Project Specialist, Dallas County Office (Texas A&M AgriLife Extension Service) graciously met with members of Loving Garland Green to teach us how to build a hose bib drip irrigation system. Under the Texas A&M AgriLife Extension’s Earth-Kind Management system, they recommend drip irrigation as one of the most effective water conservation practices. Drip irrigation is a low volume water delivery system that is 90% efficient compared to the traditional spray head applications that are sometimes only 50% effective at delivering water to the root zone. Drip irrigation reduced irrigation runoff as the slow application of water increases the soil capacity to absorb water deeply. This deep absorption contributes to deep root growth and a healthier root system for the plant. Also, delivering water directly to the plant’s root system keeps water off the leaves that can increase plant diseases and attract pests. The grids that we are constructing on Saturday are composed of drip line tubing with pressure-regulated emitters spaced every 12 inches. The outer frame of the grid is built first. It should be about six inches in from the border of the bed. The inner grid lines will be about 12 inches apart. Inner grid lines are connected with T connectors. Once the line is pressurized with water, the emitters open and distribute water according to the gallons per hour rating of the drip line used. The key point for any drip irrigation system such as this one is that it is a closed system. This means that builders must pay close attention to ensure that end caps are placed on all emitter lines. The figure above shows the end caps. Without an end cap on one of the emitter lines, the water would just flow through the tubing and onto an area not intending for watering. We are building our drip system in stages. On Saturday we will only be building the grids for the bed in the Garland Community Garden. Since we’ve never done this before, we don’t know how long it will take. We may need several sessions to complete Build One. Imagine this scene: Taking breaks and even working beneath the cool shade a pecan tree that is older than you are while working with members of Loving Garland Green to complete Build One of our drip irrigation system: assembling the drip line grids for each of the beds in the Garland Community Garden. There will be no hard work. This is light assembly. Coffee and breakfast rolls will be served. 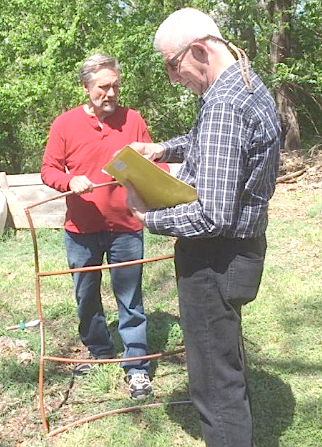 During this time you can learn all about Drip Irrigation systems as we were fortunate to learn first-hand from two Texas AgriLife experts. 1. Mark a direct path to the area we are irrigating. 3. Branch off the supply line. We will have connected branching lines in trenches to every bed in the garden. NOTE: We anticipate the work for Build Two to take 8 hours and will require rental of equipment to dig the trenches. Most likely we will mark the places for the supply trenches the day before. Overall we anticipate two months to complete this project. Bee App coming! And Pollinator Webinar coming! Wild Bee ID App from the Center for Food Safety Is Coming! Sample screens from the proposed Bee App being developed by the Center for Food Safety. Ever been in your garden and wondered what species a beautiful bee is—or indeed if it is even a bee? 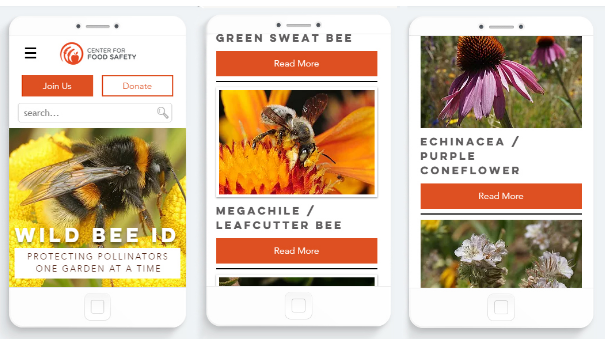 Wild Bee ID is a mobile app for iOS and Android being built as go-to guide for identifying bees and bee-friendly plants, creating pollinator gardens, and learning how to get involved in the fight to protect these critical species. Most folks don’t realize that we have over 4,000 species of native bees here in the USA. These bees come in all shapes and sizes and are often mistaken for flies and other insects. As pollinators, native bees are much more efficient than their cousin, the European honeybee. The Center for Food Safety (CFS) is a national nonprofit environmental advocacy group that empowers people, supports farmers, and protects the earth from harmful food production technologies. They work to advance organic and other sustainable forms of agriculture. One of their longstanding programs has been to protect pollinators from toxic pesticides used in our agriculture practices. As an established leader in the food movement at the forefront of the fight to protect pollinators, CFS is well equipped to spearhead native bee educational opportunities through both the Wild Bee ID app and their existing pollinator education program. 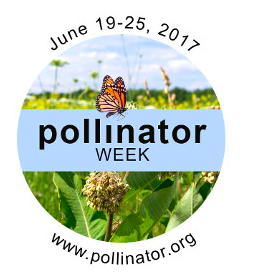 Mark your Calendar for June 28 Pollinator Webinar! On behalf of the U.S. Department of Agriculture’s (USDA) Pollinator Health Working Group, USDA National Institute of Food and Agriculture (NIFA) will host a Listening Session to discuss a strategy to monitor native bees in the United States. The conference begins at 8:00 AM Eastern Time on June 28, 2017; you may join 10 minutes prior. Step 2: Instructions for connecting to conference audio will then be presented on your computer. You will be connected to the conference with the AT&T Connect Web Participant Application - there is no software download or installation required. If you are unable to connect to the conference by computer, you may listen by telephone only at 1-877-369-5243 or 1-617-668-3633 using 0866106# or Find an Alternate Number (link is external). If you need technical assistance, call the AT&T Help Desk at 1-888-796-6118 or 1-847-562-7015. Flamingle in Garland Texas on National Pink Flamingo Day! 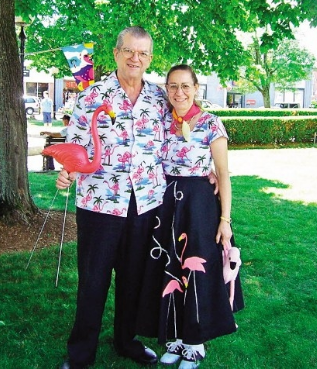 Pink Flamingo Day was declared in 2007 by Dean Mazzaralla, the mayor of Leominster, MA to honor the work of Don Featherstone, creator of the plastic lawn flamingo. While working for plastic company Union Products, Featherstone — a trained sculptor– fashioned the pink bird in 1957 after spotting its real-life model in a National Geographic magazine. During the post-World War II era, the birds could be found in suburban yards across the country. In the 1960’s they were considered tasteless. In 1972 they made a comeback following the debut of John Waters’, “Pink Flamingos” — a film that has little to do with pink flamingos. YOUR INVITATION TO FLAMINGLE IN GARLAND ON PINK FLAMINGO DAY! Garland Flamingo Neighbors are one of many of the growing neighborhood groups in Garland Texas who want to get to know their neighbors better and be more active on the local scene of our community. Garland Flamingo Neighbors worked with our Garland Neighborhood Vitality Office to see that a Little Free Library was installed in the Garland Community Garden. Flamingo Neighbors are the official stewards of the library. We hope you’ll stop by the garden sometime this summer and check out a book! 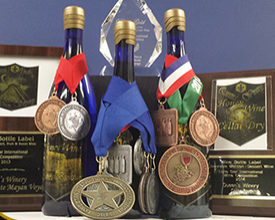 Call Ana Maria at 214-962-9674 for the time or arrive at 10AM and meet Robert! After flamingling at Ana Maria's we hope you'll stop by and see the Garland Community Garden at 4022 Naaman School Road too. 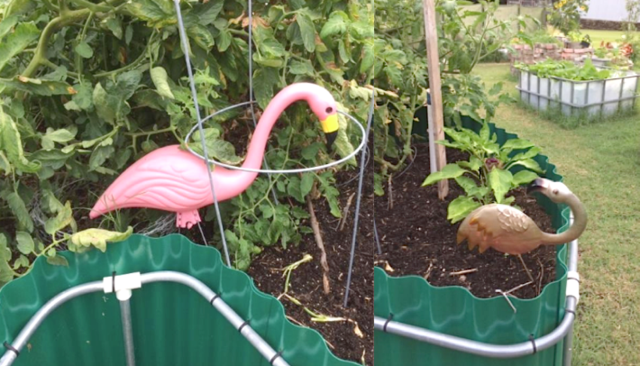 The garden has two or three plastic flamingos as well as several metal ones. Let's FLAMINGLE on Pink Flamingo Day!! Decorate your front yard on June 23 with pink plastic flamingos in celebration. Or any other flamingo decor you have at hand. I have flamingo ornaments on sale for $6.00. Let's Celebrate PINK FLAMINGO DAY!! Flamingos will be out with coffee, tea and cupcakes. Our new City Council Robert Smith will be stopping by at 10am if you want to come meet him, stop by then. Also, there will be several items for sale (t-shirts $20, jewelry and other small items by Sarah). District 8 in Garland Texas is a Happening Place with Involved Citizens! 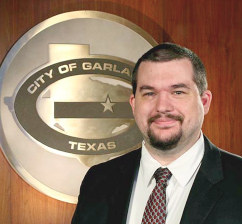 Not only is it the location of the Garland Community Garden, Loving Garland Green, and the Flamingo Neighbors: We have Robert Smith representing us on the City Council. Come meet him tomorrow at 10AM. You’ll see what I mean. 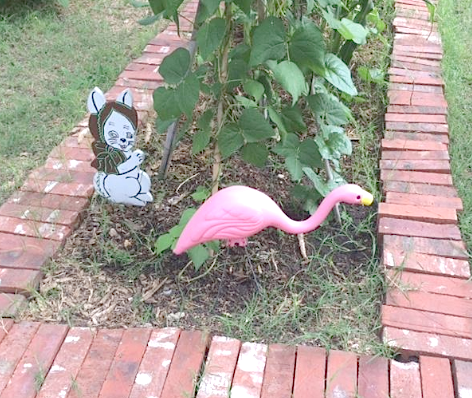 An "Authentic" Pink Flamingo Shares Space in the Children's area with the Demented Bunny. The pair keep watch over a small patch of corn yet undiscovered by the corn-demolishing beast that is devastating our larger corn patch on its nocturnal visits. I keep hoping it will get full and stop. Charlie thinks it's a family of either raccoons or opossums. 1. Why is a national monitoring plan for native bees important? 2. What kind of information/data is needed? 3. How would the information be used? In my opinion, we can say the European honeybee is inefficient, carries diseases and doesn’t play nice with other pollinators. If that’s not enough, the European honeybees are also not as efficient as other bees at pollinating crops. Domesticated European Honeybee—These are the bees that beekeepers manage in hives. They produce honey that is sold commercially. They were brought to the USA from Europe several hundred years ago. Wild bees—This term is particularly confusing as it can refer to native bees, none of which make honey beyond the tiny bit they need for their eggs, and it can be interchangeably used to mean feral honeybees who do make lots of honey. Feral Honeybees - These are European honeybees that have escaped the hive and have been living on their own for years in the wild in riparian areas and also in places like the walls of homes. Unlike the native bees, these bees produce honey. Feral bees are also called native bees. Native bees – Native bees are bees that are native to North America. According to the Xerces Society, we have over 4,000 species of these bees. With the one exception of the bumblebee, our native bees are solitary creatures that are typically ground nesters. You won’t be getting any honey from these busy workers but they are incredibly efficient and important when it comes to pollinating our gardens and crops. Migratory bees – In recent years, to add to the confusion, this term has appeared in the literature. Migratory bees are European honeybees that are commercially managed to pollinate crops. Their hives are moved/rented out to farmers who need a crop pollinated. A farmer in California may need an almond crop pollinated. Then that hive might be moved to Florida to pollinate an orange crop. Here in Garland, Texas we have a whole lot of interaction with these creatures. 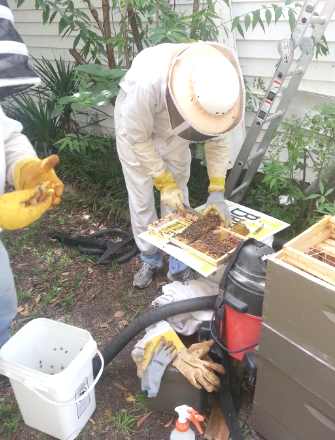 To name three: Queens Winery; thousands of native and European honeybees at the Garland Community Garden; and Cheryl's wall (Story of the recent removal of 10,000 feral honeybees from a Loving Garland Green member’s home). Down at the garden we support both native bees and European domestic honeybees. We have a hive for the European honeybees that is maintained by a group of professional beekeepers and we have little native beehives scattered through out the garden. We also hold classes once a year on the topic of native bees. Throughout the spring we have observed the presence of a lot of native bees (mainly bumblebees, sweat bees and mason bees). It would appear that our European domestic honeybees are playing nicely with their American cousins. However, I am watching closely the population of native bees closely. So far, over the three years we’ve been down there I’ve seen their population increase each year. At one point this late spring I counted 22 bumblebees in our corn patch. A recent Swedish study concluded that European honeybees had reduced the bumblebee population in that area by 81%. However, landscape heterogeneity drastically modified this effect. In simplified homogenous landscapes where flower-rich habitats have been lost, fewer bumblebees were found. No effect was found in heterogeneous landscaped areas. Once again: diversity of plant and human life is key to survival of us all. CAN BEES READ? Sign at the home of Loving Garland Green member, Cheryl Andres hung long before she realized they had taken up residence in an outside wall in her home. 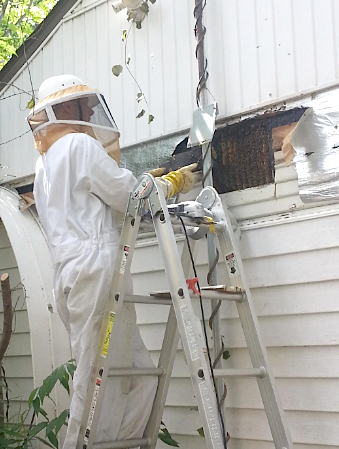 Cheryl Andres recently had issues with feral honeybees who took up residence in the wall of her home. Following are photos and Cheryl’s report of this incident. Took 6 hours of vacuuming and scooping them into buckets but the "grand extrication" got an estimated 10,000 bees out of my garage wall! Honey was delicious but since it was a new hive most of the combs went with the beekeeper so the bees would have something to sustain themselves through the winter, after which they can usually start harvesting it for human consumption. So my bees have a purpose now - their genes will help in this young man's quest to restore bee bloodlines to a classic, feral (presumably more healthy) state. Even his helper remarked how very calm and well adjusted they were - which thankfully translated to a lower cost to remove them. 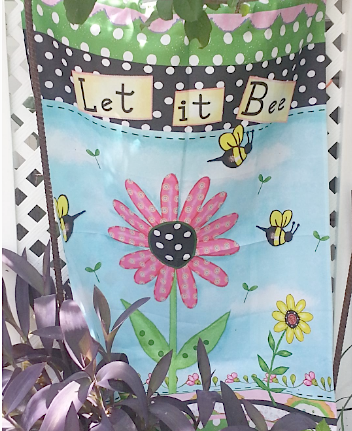 This is what I get for hanging this cute garden flag found on sale - who knew the bees would take it as a "Bees Welcome" sign? 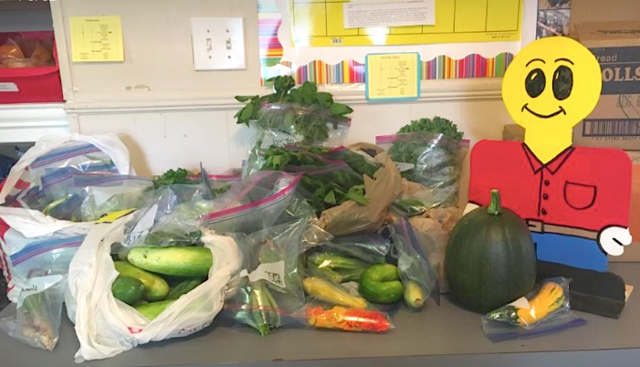 Today Jane Stroud (President Loving Garland Green) and I delivered fresh produce to the Garland Good Samaritans from the NGHS Environmental Club’s citizen scientist garden plot at the Garland Community Garden (squash, green beans, okra, cucumbers, onions, and eggplant). To date that plot has yielded over 48 pounds total (over $108 in dollar value). Twenty-six pounds of this has been donated to the Garland Good Samaritans. 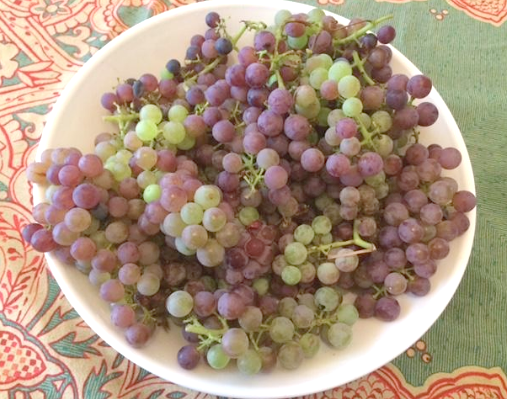 Organic grapes 3 pounds 14 ounces - Dollar Value 1.49 cents pound $9.23—delivered from my front yard to the Good Samaritans June 20, 2017—grown in the space that once supported a front lawn. 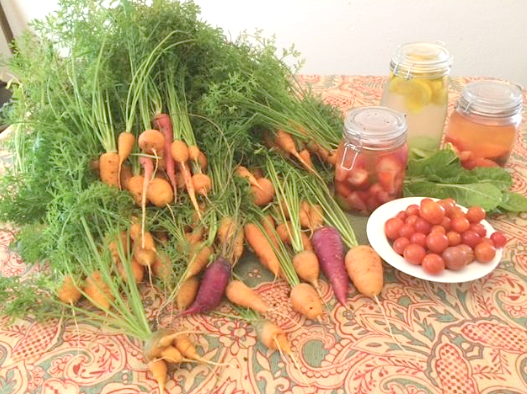 Today we also included vegetables and fruit from my garden and from Charlie’s garden as shown in the photo above. Margie Rodgers, one of the founding members of Loving Garland Green also stopped in at Good Sam’s today to deliver from her garden. Four of the eight 27-gallon pots that Loving Garland Green installed at the Garland Good Samaritans in April of 2017. All eight pots are thriving and producing beans like crazy. We also planted calendulas, an edible flower for color. In one of the pots, Pam Swendig, the director of the Garland Good Sam’s also planted corn, which is thriving with the beans. That’s the thing about dreams. We have to let other folks in on the creativity and add to the community stone soup. No one person has the corner on ideas. (Not even you or me.) We are all in this community together. The more we contribute our ideas and experience, the better our community becomes. The corn Pam planted in the pot with the beans will no doubt produce some corn. Imagine our city with pockets of not only organic gardens grown by ordinary citizens like me and you, but also of small organic truck farms operating on land in neighborhoods throughout Garland. Some of these truck farms would even have a few chicken coops and perhaps a tiny home where the chief steward for that operation lives. I am working to bring that dream into reality. Three of the most tangible results include my front yard in which most of the lawn has been replaced by fruit trees, grape vines, blackberry bushes and a few veggie plots; the Garland Community Garden which has expanded from one 32 square foot plot in 2014 to a planted space of over 3,000 square feet today; and eight 27 gallon containers installed at the Garland Good Samaritans in April of 2017. Here is one of 12 ears of our Aztec Black corn that was half eaten on the night of June 19th, 2017. It was a raccoon, an opossum or perhaps even a squirrel. We share the Garland Community Garden with an adjoining riparian area that is filled with wildlife ranging from field mice to several owls. No doubt there are probably raccoons and opossums as well and who knows what else? I certainly don’t venture into that wooded thicket that separates us from the creek and ultimately the Tollway. In fact, the Garland Community Garden is one of few community gardens in the USA to be certified as a USA wildlife habitat—due in great part to our adjoining riparian area that provides habitat for all kinds of creatures. I’ve even seen a roadrunner (chaparral) dashing out into the garden for a juicy insect perhaps. I wasn’t all that surprised when I surveyed the damage to three rows of Aztec Black corn this afternoon. But I would be a liar if I didn’t say I was disappointed. We are planning to use this corn as part of our Fall Harvest celebration the first Saturday in November when we harvest sweet potatoes. At this point there is still enough left to carry on with our plans to grind it into corn meal and make taco chips for the guests to sample. For some reason the critter(s) didn’t touch the Oaxacan Green Corn or the Bantam. But they went after the Aztec Black with the dedication of Carry Nation with an axe. It took a toll of 12 ears of corn—each one about half-eaten. 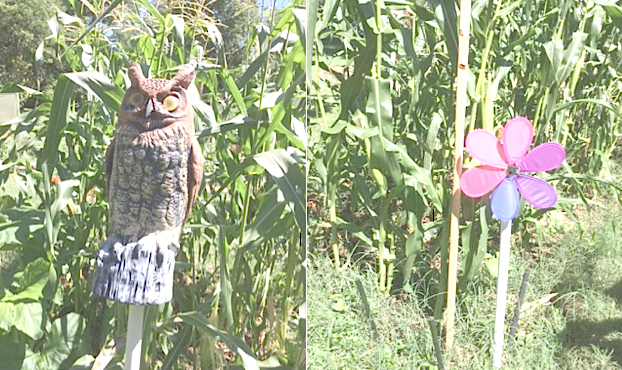 An owl, donated to Loving Garland Green by Kevin Keeling, and a garden flower propeller were installed this afternoon in the Garland Community Corn Patch (June 20, 2017) to frighten critters. Being an organic garden as well as a wildlife habitat, we don’t use chemicals and we don’t kill or even trap animals. Well the score is not good for the human team but it's great for the opossum, squirrel or raccoon team. The critters took out additional corn. This time none from the Aztec Black. Instead this time it ate from the Oaxacan Green and our Bantam Sweet Corn. All total at least 17 ears of corn--not quite half of the total yield from this patch. 1. The Aztec Black, Oxacan Green, and Burpee's Bantam corn grow very well in our area. They can be grown closely together and they produce two ears per stalk which is great. All are from open pollinated, heirloom seed. 2. The corn will be fenced in next year with some kind of fencing designed to keep four legged pests out. We would do it today but next year due to crop rotation the beans will be planted in the corn patch and the corn in the bean patch. For our celebration in November I will try to find some Oaxacan Green and Aztec Black kernels to make into corn meal for taco chips. Cucumbers, peppers. squash, mint, kale, blackberries, parsley, beans and eggplant from the Garland Community Garden delivered to the Garland Good Samaritans June 14, 2017. Photo Pam Swendig, Director Garland Good Samaritans. We may sometimes think we've failed when in fact, we have succeeded--just not in the way we envisioned. My dreams and visions often get re-packaged and I don’t always recognize them when they are right in front of me. After some retrospect I see that I am fulfilling a dream I had back a few years ago. It just occurred to me as I was looking at the photo above that Jane sent me this morning. The remembrance of this dream was stirred yesterday as Jane and I harvested food from the Garland Community Garden for the Good Samaritans. We were talking about the awful shooting that happened in Washington yesterday—the 70-something man from Illinois who opened fire on some government folks in Washington. I mentioned to Jane as we worked in the garden that I once tried to get on the ballot to run as an Independent for US Congress. Actually I tried twice. In order to get on the ballot one needs signatures of 500 registered voters from the district in which the candidate is hoping to represent. The first time around in 2010 I only collected 600 signatures and only 482 ended up being qualified voters. Steeled with that experience, the next time in 2012 I collected 2,000 signatures. I collected every one by knocking on doors and talking with people. The instructions from the Texas Secretary of State’s office regarding notarizing the signature pages were not clear to me. I couldn’t tell if only the top page needed the stamp or if every single sheet needed the stamp. I called and no one I talked with could answer my question. The last person I talked to suggested I drive to Austin and someone from the legal department from the Secretary of State’s office would do it. I drove to Austin and a representative from the Texas Secretary of State’s office notarized my signature pages. Ten days later I got a letter from Greg Abbott’s office telling me that my documents were rejected because they were not properly notarized. Of course I protested. I even called an ethics committee that is available in DC for candidates running for national office. I was told my case ‘was not in their jurisdiction.’ They suggested I consult with the Attorney General of Texas. The Catch-22 situation was a bit like seeking justice from the perpetrator. I gave up after a month of trying, but I never forgot many of the very desperate people that I talked with—at least 50 of whom I sat at their kitchen table to hear their stories. Many of these people, like the man from Illinois, were over 70 years of age living on limited resources that didn’t quite stretch over the entire month. The first story was of a man who was in his mid thirties but was horribly wasted with cancer. He had been home just a few weeks from the hospital. Home care visited him twice a week and that was it for human contact. His “friends” at work didn’t visit. He was literally a shut-in. I told him I would stop when when I was in the neighborhood. I continued to visit him about twice a week from March until November. Then one day in November there was a “for rent” sign in the yard and he was gone. The last month we hardly spoke. I would just hold his hand. It was a simple, yet important exchange between two human beings. He taught me all kinds of lessons--not the least of which was the importance of friends and relationships--real friends who stand by you-- not just acquaintances. These experiences convinced me that the only change or influence I have is at the local level where I can meet people and government officials face-to-face and have real conversations with them. That’s exactly where I’ve been for the past five years L-O-C-A-L Garland. I’m convinced that gardens like The Garland Community Garden bring people together and help educate and protect the community. I thought about that this morning when I looked at the produce we delivered to Good Sam’s yesterday. I am helping people like the elderly man who subsists on peanut butter and crackers each month—but only if he knows about places like the Good Samaritans--And then perhaps only if he has transportation to get to Garland Good Sam’s. Sometimes we hold back our gifts because we mistakenly believe them to not be enough, or good enough. In the larger scheme of things, a few pounds of fresh produce from your garden delivered to a local food distribution organization might not seem like much. However to the individual who gets those 8 ounces of blackberries or that delicious tomato from the garden, your donation is a significant treasure in their diet for the week. All good deeds add up. Driving someone to pick up food at a food bank once a month is a priceless gift to that person. If you live in Garland, you could visit the Good Samaritans. Perhaps you might decide to volunteer for this organization. 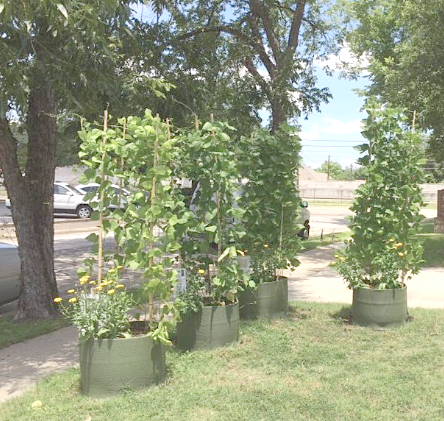 If you do visit them, be sure to look at the eight 27-gallon pots of beans that Loving Garland Green and the Good Sam volunteers installed. Each of these containers will most likely produce a minimum of 30 pounds of beans. That’s 240 pounds of food from 8 pots. 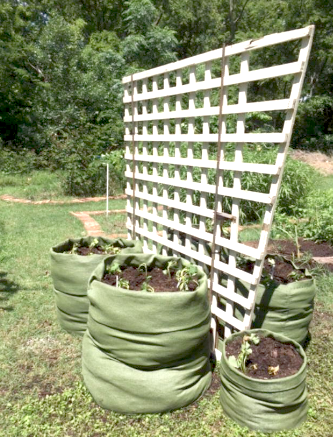 You could plant a pot of pole beans at your place too. You could even simply plant a few poles in the ground (We did that too at good Sam’s). Pole beans are the gift that keeps giving. 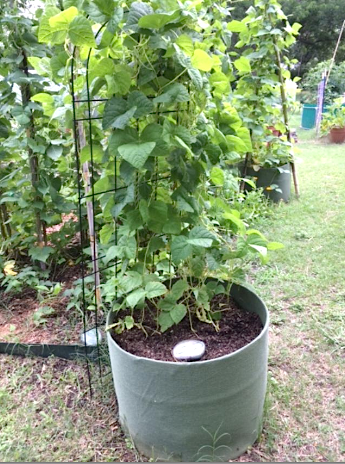 Garland Community Garden June 14, 2017 – Marie Vining Beans – This pot has thus far produced 12 pounds of beans and the season has just begun. We anticipate having beans from this one pot from now until the first frost. Pole beans will slow production down in July and August, but in September until the first frost there will be a second coming. We installed 8 of these pots at the Garland Good Samaritans in April of 2017. We are more like the Bumblebee than we may realize. 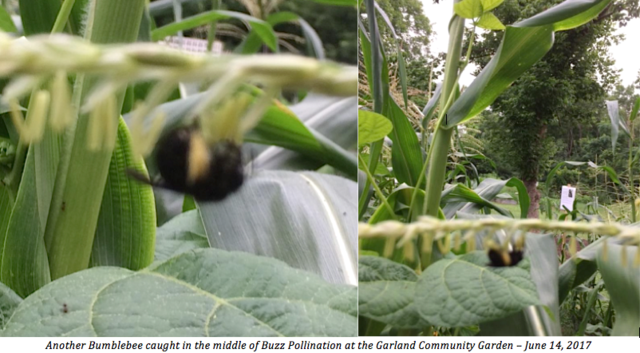 Yesterday I saw yet another bumble bee hanging upside down doing his buzz pollination thing—for himself, the corn and other pollinators. It’s a good thing to be like the bumblebee that goes ahead and does its thing without considering its importance to the chain of life. Like the Bumblebee, we are small, when considered against the backdrop of our larger universe. In fact that is the excuse that some use for never even trying in the first place. Yet the impact of a single human being moving forward in a purposeful manner can make such a difference in the life of another. We are the gift, but most of the time we forget this in our concerns over the size and appearance of the outer wrappings. I’m thrilled there are so many bumblebees and native bees swarming around our corn patch. Yesterday I also saw several metallic green Sweat Bees (Augochlora pura ). Sweat bees were so named because of their attraction to human sweat. In addition to the ones with the metallic green bodies, they are many other kinds of the sweat bee—about 40 different kinds. (Perhaps I was the one attracting them in the corn patch yesterday.) But most likely it was the corn tassels that attracted them. After having much of their pollen shaken loose by the bumblebee buzz pollination* the tassels made “easy picking” from other smaller pollinators like many of our tiny native bee that are often mistaken for flies. These “Johnny-come-later” native bees don’t have to work hard to get some pollen. Pollen is a big deal—a critical substance for human life. I know it makes some people sneeze, but without pollen and without our pollinators, we would starve to death. As pollinators, Bumblebees contribute to our food security and the healthy functioning of our ecosystems. They are keystone species in most ecosystems, necessary not only for native plant reproduction, but also necessary for creating seeds and fruits that feed us. And, as observed yesterday and today, Bumblebees support other pollinators as well by making it easier for them to get pollen. Folks who look upon the destruction of a species as no big deal are people who lack an understanding of the bigger picture of the interrelatedness of all life on our planet. All plants and animals have a role to play in the vast chain of life. The loss of even one species has a negative effect on the entire chain. I am convinced that ironically it's people who live in urban areas who have the most power to recover and save not only the natural world, but our agricultural system as well. We can do this by restoring habitat for nature right in our own yards and city parks by using these areas for growing native plants and a few edibles. In urban and suburban America, we still live in an upside down world where the lawn rules supreme with a few shrubs up near the house and perhaps a few pansies around the mailbox. We will have to change some of the things we tell ourselves about our lawns. Perhaps a good starting place would be asking ourselves: who or what does a lawn serve—especially in the front yard. Children don’t play on them and they do not support any life—how could they with the amount of chemical fertilizers and Roundup that are poured on them year after year? Sometimes it seems as if we are devolving instead of evolving as a species. For example, 300 years ago the European settlers coming to the USA brought dandelions with them as a winter green. Today, we spend billions of dollars every year to eradicate this plant we now identify as a “weed.” These activities are made all the more absurd by the fact that when our weather turns hot, the dandelion dies anyway. If more of us could only develop an affinity for dandelion greens and dandelion tea. All it takes is for individual urban homeowner and even apartment dwellers to choose to plant a few edibles or native plants. Put some diversity into the urban landscape. Then observe, enjoy and learn from what you plant and the visitors to your habitat and garden. A great argument for a garden over a lawn is water. A garden uses 66% less water than a lawn. Corn, according to most “experts” that I read, is pollinated almost entirely by wind. 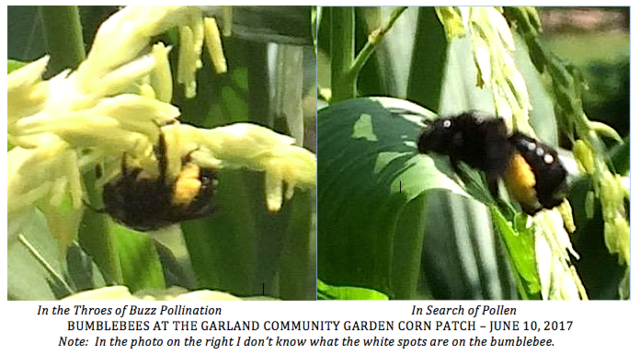 I guess the swarm of bumble bees and other native bees down at the Garland Community Garden didn’t get that memo. 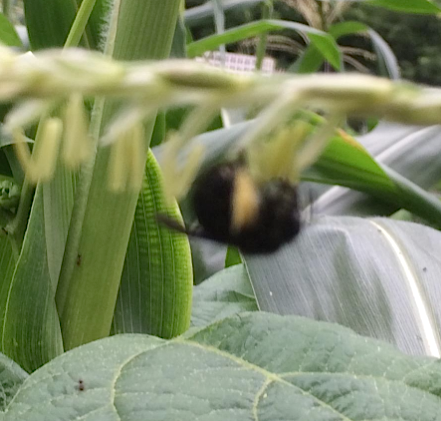 This afternoon they were thick on the tassels of our Aztec Black and Oaxacan Green corn and they were doing what is called the bumblebee "buzz pollination.” They hang onto the plant and vibrate to loosen the pollen in the tassel pod. I love to watch them doing that. I didn't see any ears on our Bantam which is planted in a patch in front of the Aztec and Oaxacan Green but it was planted a week after and to tell the whole truth, I was in a hurry and didn't check real closely. 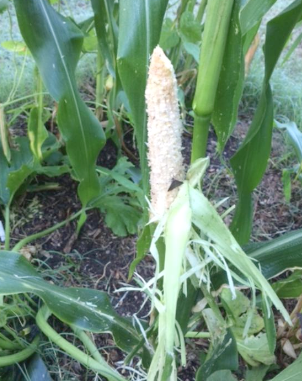 I snapped off a couple of tassels and shook them on the silk of the new ears of corn, dusting both ears on each stalk--just in case the bees missed some. If you've ever eaten an ear of corn that is missing kernels, that usually means the corn didn't get adequately pollinated. Corn grows with one ear higher up on the stalk and this is the one that usually gets sufficiently pollinated. (I know most of you know this so bear with me but a few might not.) The second ear, located farther down the stalk is somewhat in the position of mammals who get the "hind teat." The Aztec Black and the Oaxacan Green will be ground into corn meal and used to make taco chips for our November 4 Fall Harvest at the Garden when we'll be harvesting the sweet potatoes and the loofahs. If you've seen blue taco chips, they are made from Aztec Black corn meal. The Oaxacan Green is usually a cultural local tortilla made in Oaxaca. We might have tortillas or we may toast them into chips. The Bantam Sweet corn we will share some with Good Sam's and use the rest for seed to share with the community as seeds for next year. We also have an entire patch of Teosinte down at the garden. Teosinte is the common name for a group of four annual and perennial species of the genus Zea native to Mexico and Central America. 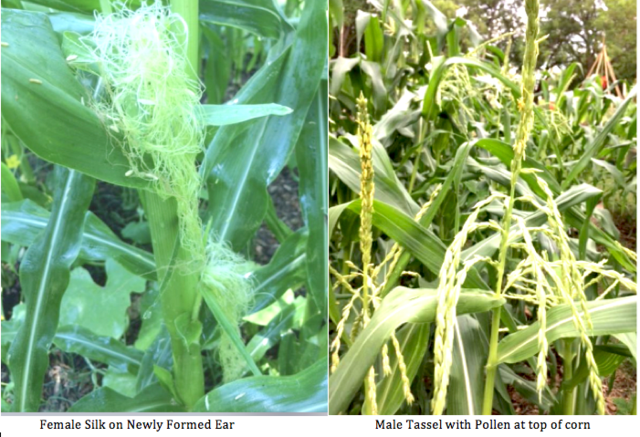 While the maize and teosinte plants share a similarly robust growth form, their female inflorescences or ears are strikingly different. The teosinte ear possesses only about 5 to 12 kernels, each sealed tightly in a stony casing. However, it is noteworthy that the ancients still pounded these seeds into meal and made bread from it. The best estimate is that maize was domesticated between 6,000 and 10,000 years ago. Susan Metz, one of our many community friends of the garden, donated the seed for this patch. Susan has all kinds of degrees in horticultural and agricultural science and has been involved in agricultural research her entire life. Thus she has access to all kinds of exotic seeds that she shares with us. Teosinte takes about 120 days to mature. By the time we got all the Bermuda grass out of this plot and the Teosinte seed planted, the Aztec Black, Oaxacan Green and the Bantam were already about 6 inches high. (Thus this plot is behind the other corn plots as the maturity cycle for all our other corn is about 90 days). Corn or Maize has been traced back to Teosinte. 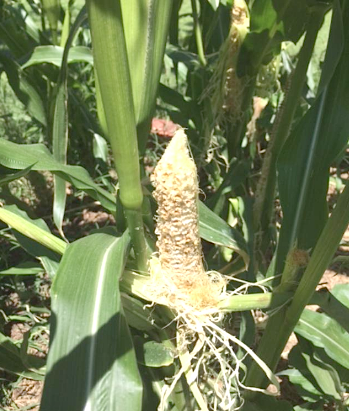 Horticulturists are doing many different experiments these days with teosinte and other species of corn creating hybrid plants, as teosinte is especially disease resistant. I plan to learn more about hybrids over the winter with my reading. I'm still holding a somewhat of a paranoid stance toward participating in the development of hybrids, as their seed in the next generation are so iffy. In fact, except as part of some experiment, I wouldn’t even bother to save seeds from hybrids and plant them. If you’ve ever saved seed from produce purchased at the grocery store and then not have any good results (poor produce, or sometimes none at all)—most likely it’s because the seed you saved was from a hybrid. We will share some of the Teosinte (Tay O sin Tay) seed with school kids and also we plan to grind some into corn meal for our Garden Harvest Festival November 4 that we'll make taco chips out of. Imagine the experience of eating the same food that people ate almost 10,000 years ago! I did a little research yesterday when I got home from the garden. I am a little concerned that the insect I saw on the corn tassel might have been a baby Helicoverpa zea. In its larval stage this moth is known as the corn earworm. We’ll see what transpires with the corn. If this is indeed a corn pest and it destroys most of our corn crop, then next year we will take definite action. If it only eats a small part of our crop we will likely live with it. If it is determined that we won't have any corn to eat otherwise, we will order a box of nematodes next year. The going price for the gardener is $36 for 1,600 square feet. Entomopathogenic nematodes, which are available commercially, provide good suppression of developing larvae if they are applied to corn silk; this has application for home garden production of corn if not commercial production (Purcell et al. 1992). Soil surface and subsurface applications of nematodes also can affect earworm populations because larvae drop to the soil to pupate (Cabanillas and Raulston 1996). This approach may have application for commercial crop protection, but larvae must complete their development before they are killed, so some crop damage ensues. A true community garden is like the stone from that old fable, “Stone Soup”. 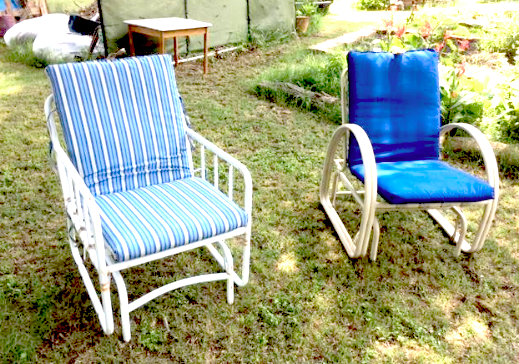 If it’s working well, the garden encourages folks to share their resources. There are so many good feelings, community connections, and packets of love in many other forms (bricks, trellises, yard furniture, soil, etc.) left at the garden that I imagine a vapor of love and caring surrounds it. Over the past three years several people have reported to me they feel like the garden is a healing space. One of our neighbors came down to the garden and planted two tomato plants—both of which are thriving. She does not have a place for growing tomatoes in her yard. Her husband who is dying of cancer loves tomatoes from the garden. She planted the plants for him. A young woman whose grandmother recently died comes down to the garden about once every ten days or so and weeds. Her grandmother was a gardener and weeding makes the young woman feel closer to her. Several times a month we have visitors from clients at the health spa located next door to the garden. These people report the garden’s peaceful, calming effect. Many studies investigating the Biophilia hypothesis substantiate their reports. The biophilia hypothesis suggests that humans possess an innate tendency to seek connections with nature and other forms of life and that these connections result in healing effects such as lowering blood pressure, calming a racing heart, etc. Edward O. Wilson suggested that human beings have an innate urge to affiliate with other forms of life. Yesterday Jane and I installed five huge pots of sweet potato slips. These pots will be part of our Sweet Potato and Loofah Festival that is planned for November 4—the first Saturday in November. This event is a combination of fun and education for our community. This installation was made possible by the donation of a wooden trellis by at this moment, an anonymous donor. I’m checking the source out with one of one our local businesses here in Garland—The Tin Lizard (a local Garland business) as they mentioned the possibility of donating a trellis. It was left when a steward was not in the garden. The pots are another example. I made them from environmental cloth that was donated to us from the Byron Nelson Classic last year. They had used the cloth for shade and to create temporary fencing. One of the many gifts of a community garden and growing at least some of the food we eat is the resulting awareness of the connectivity of the food we eat to nature and to our health. We develop a deeper appreciation of food and are more likely to adapt more sustainable life styles, make healthy food choices, and reduce food waste. Food waste is a huge issue in the USA but the good news is that we can all do our part to end it. It is estimated that over 40% of all the food we grow ends up in landfills. That is not acceptable and I believe that beginning at the local level as individuals we can change this. We do have support from our government at a national level which I consider ironic since part of the reason we have such an unsustainable agricultural system in the USA is because of government subsidies of billions of taxpayer money that is paid to mega food corporations like Cargill and ConAgra every year. 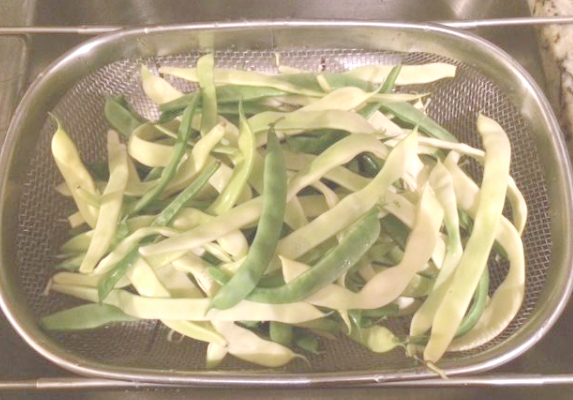 Two pounds of Italian flat beans and yellow Marie Vining Beans from the Garland Community Garden—June 3, 2017—You cannot even purchase these heirloom beans in a grocery store. How can the value be measured? It really cannot. For a better world: Take chances, live on the edge and use your heart instead of numbers to take measurements of your achievements. I was thinking last night as I recorded the amount and value of vegetables that I harvested from the Garland Community Garden on Saturday—6 ¼ pounds of produce with a $10.53 current market value. The real core of things that are truly of value lies much closer to the heart and the human spirit where things tend to fall into that category of priceless and are in fact as immeasurable as love. Still, out there in the “real world” as we call that place where the good, the bad and the ugly bump into each other on a regular basis, we persist in our attempts to measure the immeasurable. There will always be resistance to new ideas but that should not deter people from stepping out of their comfort zones to move forward—it’s called progress. And so was the case with the Garland Community Garden in the beginning. For some reason, most of us fear change—primarily because with change often comes the relinquishing of control and power coupled with the specter of the unknown. Yes, we actually had folks who were opposed to having a Community Garden. Most of us prefer to live our lives in the comfort zone of the familiar and are reluctant to venture to the edge, but it is on the edge where all the wonderful and almost magical new things transpire. This is especially true from an environmental perspective. “Edge” is a key concept in ecology. In fact, we have what is known as “the edge effect.” And this is really why I so much had my heart set on the current location of the Garland Community Garden at 4022 Naaman School Road here in Garland Texas. In nature we have edges everywhere. At the Garland Community Garden we have the creek, the riparian area and then the edge where the garden exists between the riparian area and the meadow that is maintained by the city. I knew if we put it there that our garden would someday be not just good, but great. Many members comment how well things grow down at the garden compared to the gardens at their homes. I attribute that to the location of our garden on the edge as well as to the emerging design of our garden based on our dedication to permaculture principles and organic gardening. Furthermore, each year as we continue to rebuild the poor soil that was there in a manner that is in keeping with natural processes, and as we learn from the experience of stewarding this space, the garden will get better and better. Our garden is the boundary or edge between two ecosystems: a riparian area and a meadow. In permaculture, one of the principles is to maximize the edge and that’s what we are doing at the garden. We are maximizing the edge between the riparian area and the meadow. More and more our beds in the back and even some in front are following the natural principles of what happens in the riparian area as we modify them with hugelkulturs to mimic what happens on the forest floor. The edge is rich with biodiversity. For example, where the river meets the land, the species that live in both environments are present in additions to new species that live in the transition zone known as “the edge.” The edge is richer than what lives on either side. The edge is where things happen. As the edge effect increases, the boundary habitat allows for greater biodiversity. Maximizing the edge in our garden has been part of its design from the very beginning. Straight lines and smooth shapes reduce the amount of edge. Notches, irregular shapes, mounds, pits, etc. increase the edge. That is why you only see three beds in our entire garden fashioned as rectangular, linear, wooden beds. All the other beds are irregular shapes and tend to be mounds. These beds increase the edge in the garden. Although we will always have a certain amount of vegetables in the garden, each year we will continue to add edible perennials that grow well in our area. The blackberry is one of these plants. Currently we have about 25 blackberry plants in the garden. The garden is still expanding in terms of its beds. This year we added four new beds and also combined two beds to make the experimental garden for the North Garland High School environmental Club. All in all we are evolving more or less toward what is called “a forest garden”—a low-maintenance sustainable plant-based food production system based on woodland ecosystems. In the 1980’s Robert Hart applied forest gardening in temperate zones for the first time. Prior to him this was an ancient method limited to the tropics. He followed the maxim of Hippocrates to “make food your medicine and medicine your food.” I estimate that it will take us about ten more years to realize our garden as a forest garden. And it’s possible we may never reach this goal. Still that’s no reason for not aiming for the stars. 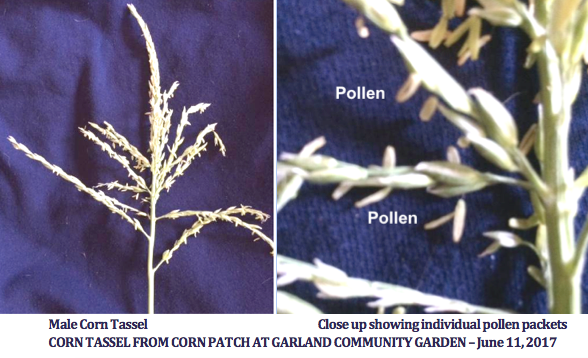 What if Garland Community Garden and Its Stewards Never Existed? 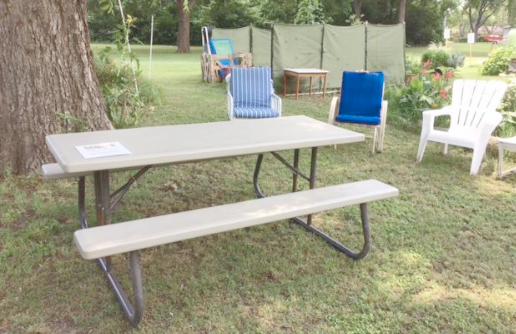 Eleven people in Garland would not have a garden built in their yards. 60 students at Beaver MST would not have had an eight-week botany elective class on Community Gardens. Watson MST students would not have a hugelkultur in their schoolyard garden. North Garland High School would not have a butterfly garden. A group of home-schooled children would never have had the opportunity to learn about the value of native bees in a garden. 60 Watson MST students would not have had a four-week course on composting. 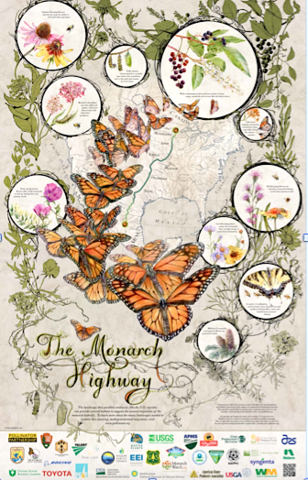 Many Garland ISD students would not have been able to see a monarch caterpillar transform into a butterfly. 110 Watson MST students would never have experienced a two hour tour of the garden that includes lessons in loofah shucking, worms, soil building. Some of the students on this tour picked blackberries for the first time. High School students such as those from the North Garland High School Environmental Club would not have been able to have a three-month gardening and leadership experience. Most likely several hundred people in our community would still be thinking that leaves put curbside in bags go to be recycled when in fact they go to the landfill. Loving Garland Green’s November 2016 Leaf Campaign changed that. 69 Beaver MST first-graders would not have had a garden experience that included planting five containers of sweet potatoes.